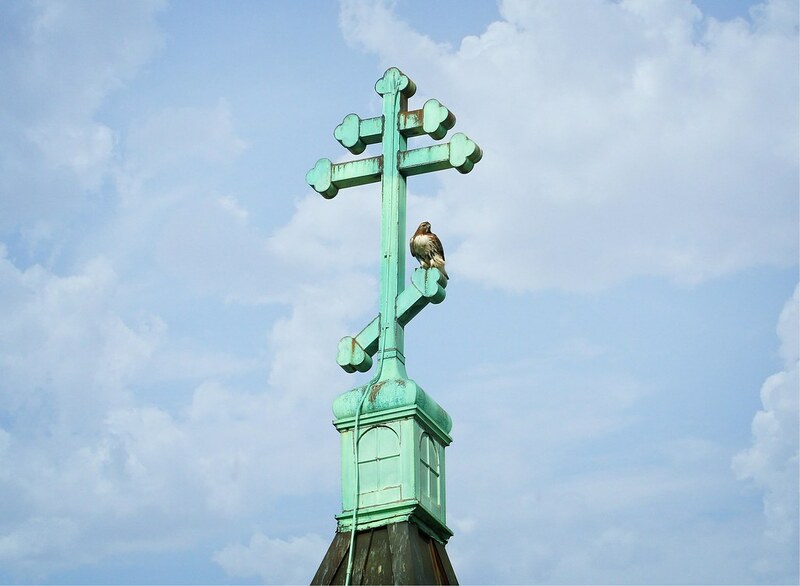 Red-tailed hawks, Christo and Dora, are embarking on their fourth nesting season in the East Village. It's hard to believe they've been here over three years already and I'm grateful to have been able to spend so much time with them and share the experience. They've had three sets of three kids in three years, and three different nests. Imagine having a new apartment and new family each year! This last fall, they inexplicably built a fourth nest in Tompkins Square Park, so it will be interesting to see if they decide to use it, or go back to their previous nest in the ginkgo tree near Avenue B and 8th Street. Personally, I hope they re-use that one as it seems to be safe and sturdy, but I don't have the mind of a hawk. 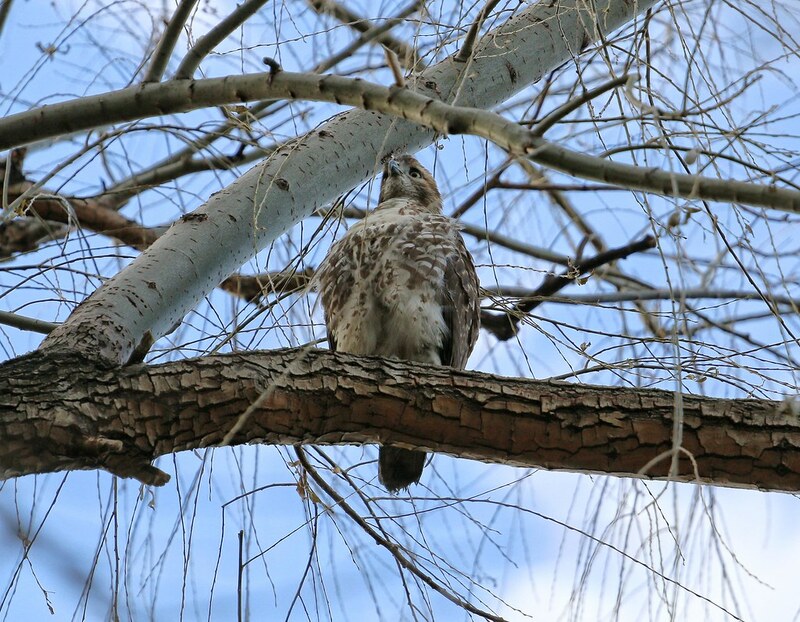 The hawks should start serious nest-building in late January, and maybe then we'll know their plans. Until then, Christo and Dora still have their hands talons full defending their territory against other raptors. On the last day of 2016, I found Dora calling from the cross of St Nicholas of Myra on Avenue A and 10th Street. 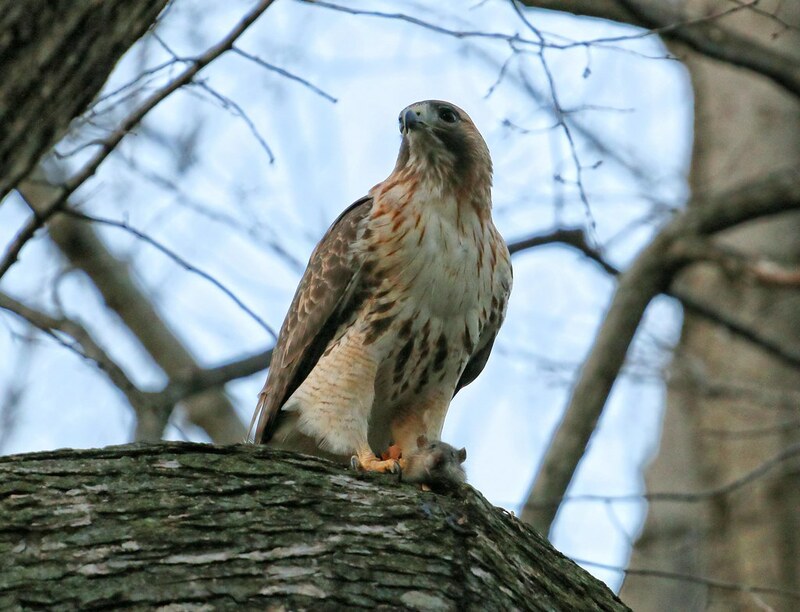 An intruding juvenile red-tail was in the area, and the hawk pair wasted no time sounding the alarm and escorting it out of their territory. 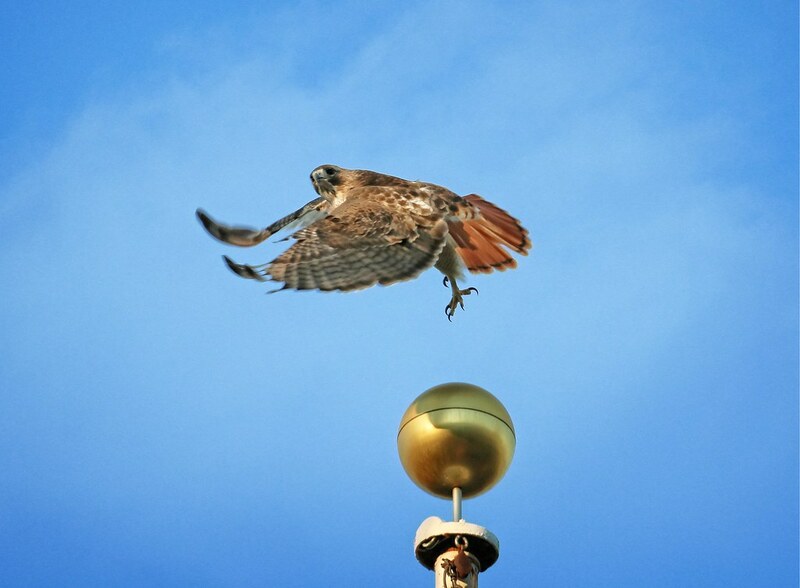 That same afternoon, a Peregrine falcon circled over the park offices. 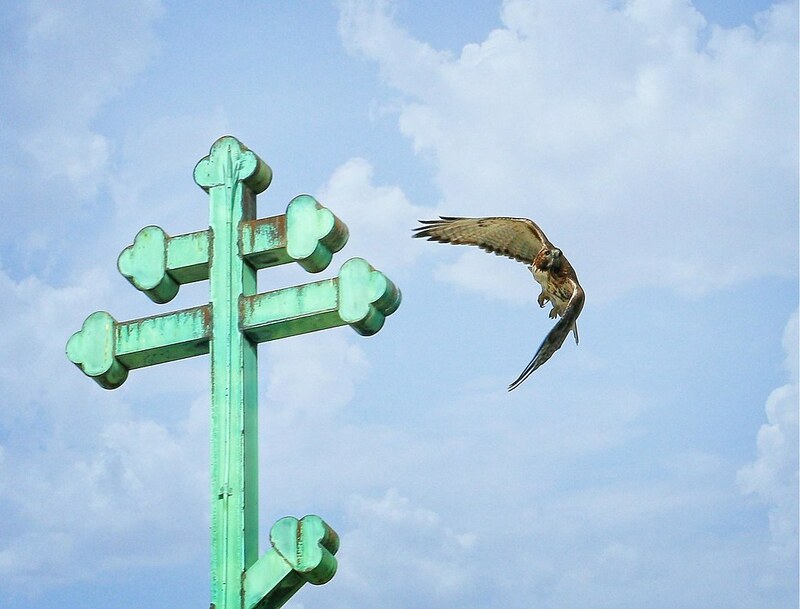 This was the second time that day I saw a falcon, and they've been spotted fairly regularly over the last few weeks. I don't know if it's the same falcon each time, or different birds. 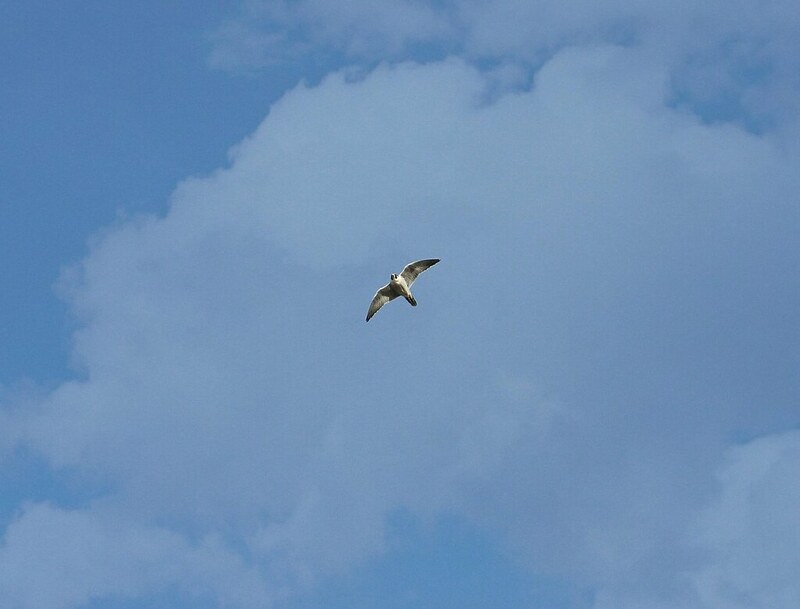 They usually fly very high, so it's not possible to make out any identifying features. 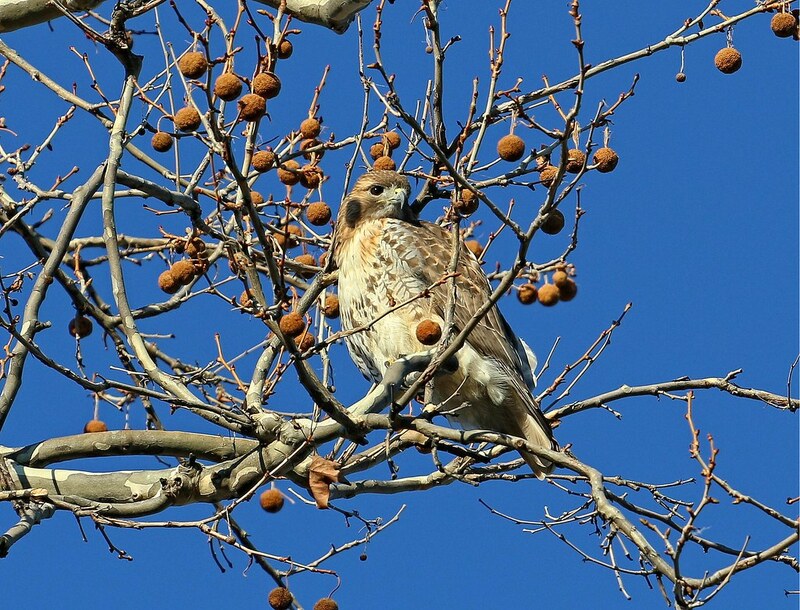 Later that day, I found this juvenile red-tail relaxing in a tree in the neighborhood. Could this be the one that's been giving Christo and Dora so much grief? Probably. 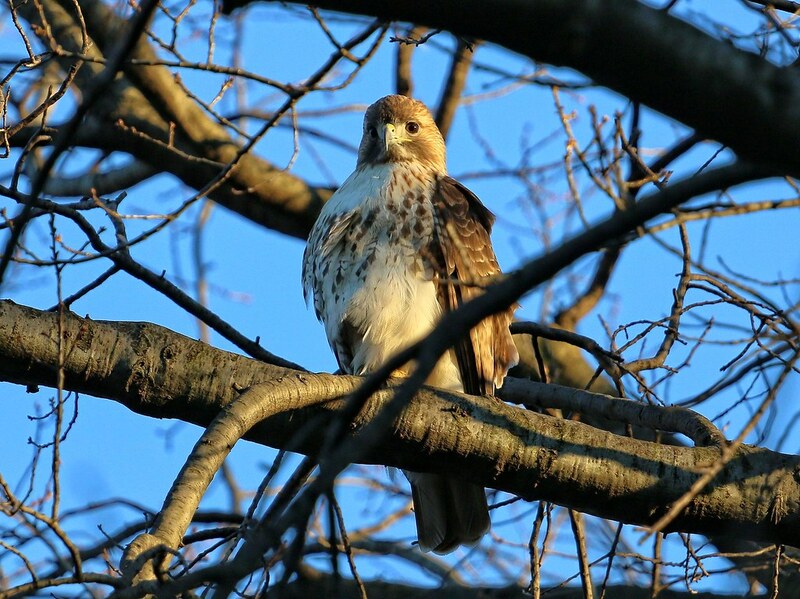 There have been several young red-tails wintering on the Lower East Side this year, so any of them could stray into the Tompkins Territory. People often ask me if these juveniles are Christo and Dora's offspring. I really don't know and it's impossible to tell without DNA testing. 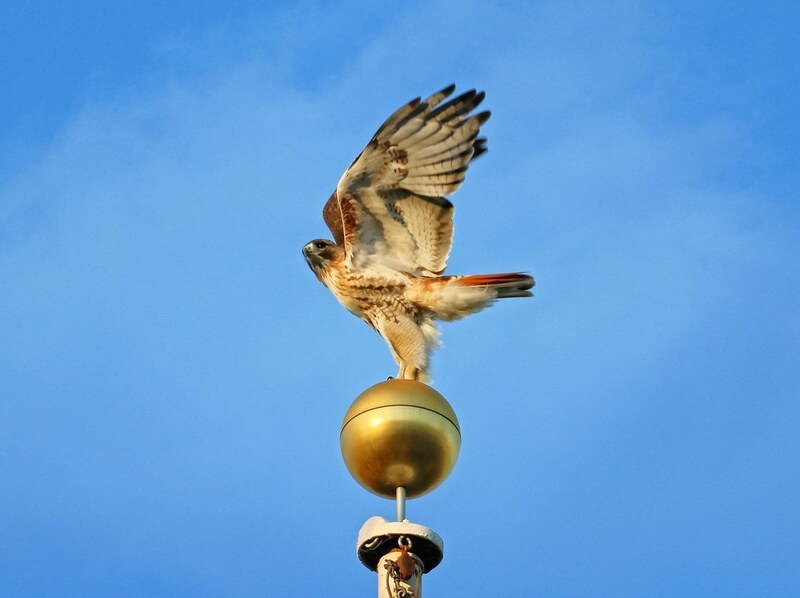 They might be related, but there are a lot of juvenile hawks that migrate through the city each year. On New Year's Day, Christo graced us with his presence in the sycamore at the St Mark's entrance to the park. Dora was perched in the same tree, but she has a real talent for avoiding the camera. 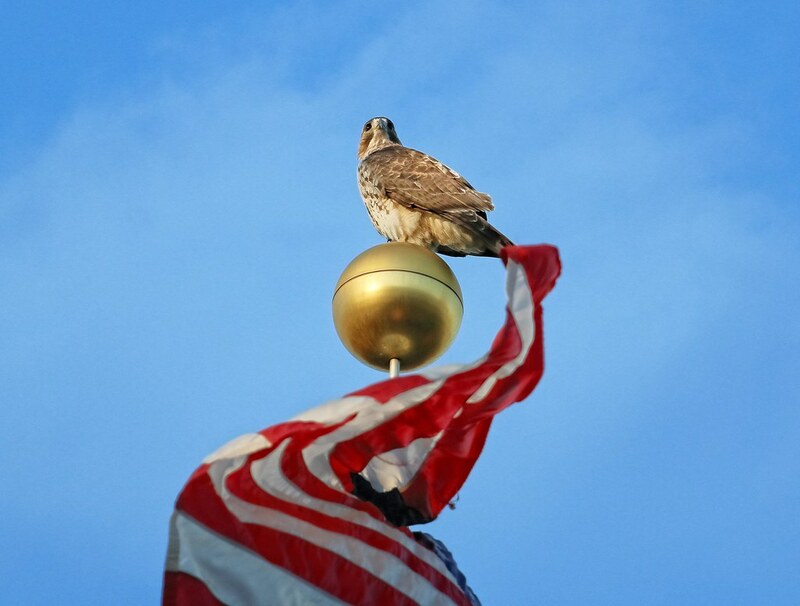 Christo reminded us (as if we need reminding) he is King of the Park by taking his place atop his flagpole throne. I never get tired of watching him take off. Christo prepared the traditional New Year's hawk feast: Rat tartare. After he ate his fill, he retired to a tree on 10th Street to spend the night while Dora flew in after dark and finished off the leftovers. The more time I spend with these hawks, the more I appreciate how special they are. 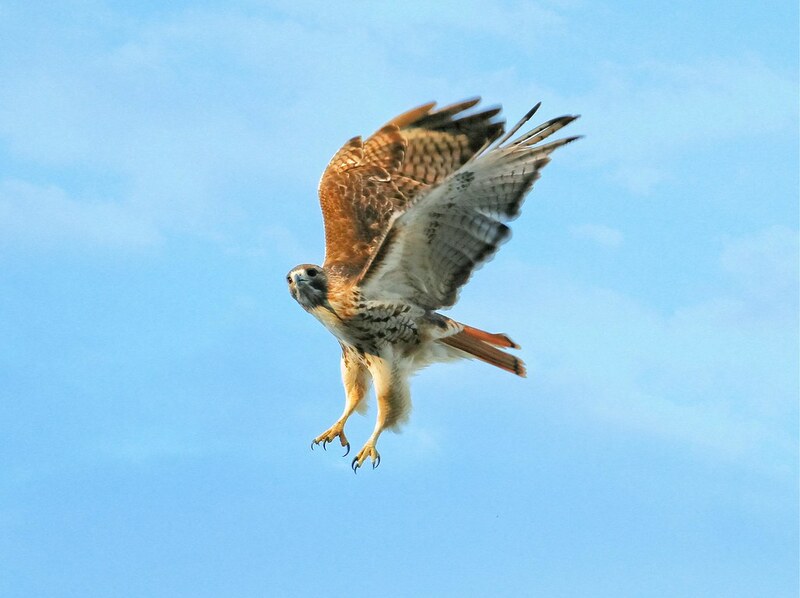 Red-tails are common birds across the country, but rare in the city (although their numbers are growing). To see them so close and to be able to study their behavior and day to day lives is such a treat. We've been able to experience them in ways that would be impossible in a rural environment.